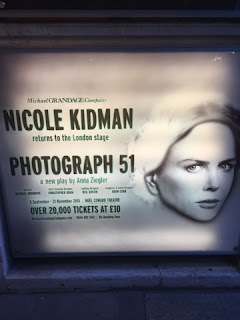 Last Friday night Stuart and I went to see Anna Ziegler's award-winning play Photograph 51 at the Noel Coward Theatre in London’s glitzy Covent Garden. Starring the luminous Nicole Kidman as little-known British scientist Dr Rosalind Franklin the story tells of the hunt for the structure of DNA in the early 1950s. But does this story of the hunt for the double helix have enough twists and turns to keep us entranced? Read on, dear reader. Read on. Our story starts with Franklin moving back from Paris to London to work with scientists at King's College. But from the get-go she encounters sexism, prejudice and elitism. Her stellar skills in chemistry and crystallography lead to her taking increasing detailed photographs of DNA. But her photographs are initially ignored, then admired and finally - as in the critical photograph 51 - effectively stolen. So why did Franklin not know how precious her diffraction photographs were? Why did she insist on having every single fact in front of her before reaching any conclusions? Was it a fear of failure instilled from years of relentless sexism? Was it her frosty defensiveness that meant she was unable to collaborate - a collaboration that would have perhaps seen her join Crick, Watson and Wilkins as Nobel Prize winners had she lived? What needed to be sacrificed in the pursuit of science, love and a place in history? The story is quite compelling and Nicole Kidman's performance as Franklin equally so. Her button-downed portrayal is sometimes thoughtful, often repressed, and occasionally downright angry and perfectly shows the frustration that any women must have experienced in a male dominated world of scientific research back in the day. And probably even in these enlightened times too. It is a brilliant performance with excellent support from the all-male actors orbiting Ms Kidman. So what drew her back to the West End since her debut back in 1998 with her performance in David Hare's The Blue Room? "It's written by a woman, and it’s about a woman that a lot of women don’t know about." 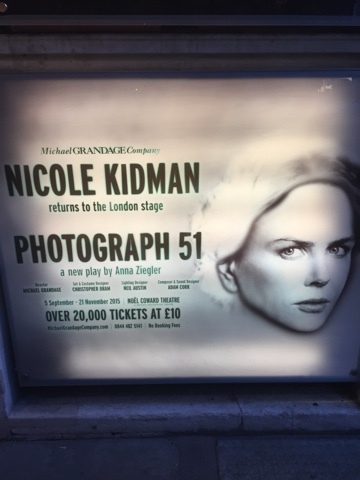 So if you like Nicole Kidman, you like a good play and good story and you like a bit of social commentary on sexual politics - this is the play for you!